History of Huntingdon and Blair Counties, Pennsylvania by J. Simpson Africa Philadelphia, PA: Louis H. Everts, 1883, pp. 280-288. Contributed by Mike Gifford. THIS township lies north of the Juniata and east of the centre of the county. It embraces in the main all that body of land lying between the township of Miller on the northeast and the river on the southwest, which is inclosed by the Stone and Lick Ridges. The former and Murray's Run separate Henderson from Oneida, while the latter are along the Brady line, except the upper part of Henderson, which extends to the valley of Mill Creek. The general surface of the township is elevated, and in the main is much broken by deep and narrow valleys, whose in-closing hillsides are usually too steep to admit of profitable cultivation. The uplands are of the nature of plateaus, containing some level lands, whose soil is thin and only moderately productive. The soil of the township is variable, a slaty loam predominating. It appears to be well adapted for fruit culture, and lately that industry has become one of the chief occupations of the inhabitants. The drainage is good, being afforded by numerous ravines in which are brooks, and a few streams of larger size. Among the latter class are Sugar Grove and Pike Runs, both in the southeastern part of the township, flowing into the Juniata. The name of the latter stream was derived from the presence of large schools of fish of the pike species in the early history of the county. The former title was applied on account of a fine grove which grew along the stream. Murray's and Brown's Runs in the northwestern part of the township derived their name from early settlers on their waters. In the northeastern part are the head-waters of Mill Creek. Some of these streams afford limited water-powers, which have been utilized to operate small saw-mills and woolen factories. Pioneer Settlers. - In no township of the county have the changes of population been greater than in Henderson. Scarcely a representative of the original settlers remains, and in many localities the entire population consists of people whose citizenship in Henderson does not extend beyond a quarter of a century. Another peculiarity attending the transformation of the population of the township is the fact that almost entire communities removed to the same locality in the West, Illinois and Indiana receiving the chief influx of immigration, while their places were taken by settlers from other parts of this and adjoining counties, a considerable number being of foreign descent. The history of Henderson, consequently, is less complete than it would be if ordinary conditions prevailed, as much of the story of the pioneer life of the ancestors of the present inhabitants will have to be given in the sketches of other townships. Col. John Fee lived on the Juniata opposite the Raystown Branch as early as 1774. He served in the Revolution, and was an active member of Capt. Blair's expedition against the Tories. His sons John and George both were in the American army in the war of 1812. He kept a public-house on the river, and later was engaged in the same business at the Warm Springs. His last place of residence was in the eastern part of Henderson, on what is known as the John Lower farm. Col. Fee was twice married, his first wife being a Miss Kelley, the second a Miss Jackson. By the former he had a son named John, and by the latter, among other children, a son named George, who married Mary Porter and reared a large family of children bearing the names of Jackson, William, John, Washington, James, Rachel, Lydia, and Mary. The first daughter became the wife of Isaac Brown. George Fee removed to Fairfield, Iowa, when he was eighty-six years of age. Stephen Kelley was a half-brother of James Kelley, an early settler in Brady. He located on Pike Run about the close of the last century, and died there more than fifty years ago. He was married to Mary Stewart, of Union township, and had children, - Elizabeth, who married Jesse Yocum, and died at Mill Creek, and other daughters named Lydia, Rachel, and Rebecca. A son, Aaron, is yet an old citizen of Mill Creek. In the same valley lived James and John Williamson, whose families have long since passed away. Matthew Campbell was a pioneer on the Peter Swoope place in the eastern part of Henderson. He was married to Hannah Postlethwaite and reared a large family, the living members of which all reside in the West, - John A. moved to Warren County, Ill., where he died; William removed to the State of Ohio; Thomas P., for years a prominent attorney at Huntingdon, died at Davenport, Iowa; Matthew Fairman, for several terms register and prothonotary of the county, moved to Kankakee, Ill.; James, a printer by trade, died a young man. His daughters married, - Hannah, Samuel R. Boggs, of Henderson, but who removed to Mercer County, Ill., in 1848, where he died; Martha became the wife of Alexander Porter, of Henderson, and migrated to the same place in Illinois; Rebecca Ellen married H. R. Gilleland, and moved to Illinois. Robert Campbell became a resident of the same State. Matthew Campbell died in Henderson, and his widow survived him about forty years, removing with her children to Illinois. Another senior member of the Campbell family, John, died at Mount Union. He was the father of Matthew F. Campbell, of Mapleton, and of Robert Campbell, of Pittsburgh, where he died in 1852; Sarah was the wife of Richard Rush, of Allegheny City; Mary Campbell became the wife of John Beatty, a pioneer teacher, who was commonly known as Master Beatty; Rebecca Campbell was the consort of James Hemphill, of Huntingdon, the father of Samuel Hemphill; Martha Campbell became the wife of John Postlethwaite, a son of Col. Postlethwaite, of Mount Union. They settled in Henderson on the Simon Bayles farm, moving from there to Mercer County, Ill. They had sons, - Matthew, Carmon, and John, who also moved to Illinois. The daughters married, - Ellen, James Lane, of Brady; Hannah, Arthur Graham, who removed to Illinois; Martha, John Simpson, of Henderson; the youngest daughter married the Rev. William Meade Jones, a Baptist minister to Hayti, and subsequently to Jerusalem, where Mrs. Jones died. He is at present the pastor of a Seventh-Day Baptist Church in London, England. The Hight family came from New Jersey, and lived in the Murray's Run Valley. Besides John, James Hight lived many years in Henderson, removing to Huntingdon. Mark Evans was the son of Rolland Evans, who settled in the northern part of Henderson at a very early day, and brother of Mark, Asahel, Jesse, and William Evans. Descendants of this family in the third generation yet reside in Henderson. On the present John Warfel farm Daniel Brown was a pioneer, dying in that locality about sixty years ago. His son, Asahel H., removed to Iowa. Nancy became the wife of James Hight, of Huntingdon; Mary, of Henry Hutchinson, of Henderson, father of James Hutchinson, of this township; Sarah, of George Hanawalt, who moved to Iowa; Ruth, of James Sloan, of Henderson; Elizabeth, of --- Weaver, a school-teacher, who moved to Iowa. Among the settlers of a later period was James McCartney, who lived east of Union Church, and died on a farm which he had improved. He was the father of John R., Robert, William, and Daniel McCartney, the former being a citizen of Henderson at this time. William Porter, a native of the north of Ireland, came to America about the beginning of the present century, soon after settling in Henderson, where he purchased a large tract of land, most of which is at present owned by the Rhodes family. This land he divided between his sons, James and John, who became well-known citizens of the township. He died at Huntingdon in 1850, aged eighty-seven years. Mary, his wife, had died many years previously. Their children were Nancy, the wife of Samuel Wiley, who moved to Indiana; Mary, born on the passage to America, became the wife of George Fee, son of Col. John Fee, who removed to Iowa in 1855; Jane became the wife of John Brown, of Henderson; Martha, the wife of David Thompson, of Henderson, died about 1860. The husband survived until December, 1880, when he died at the age of eighty-two years on the farm which he had occupied more than sixty years. 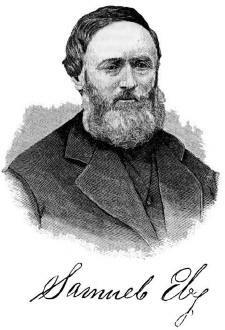 He was a blacksmith by trade, and a very exemplary man, serving many years as an elder in the Presbyterian Church. Of a large family, one is Dr. James P. Thompson, of Johnstown; three of the sons, Joseph H., David, and Robert, served in the Union army in the Rebellion, the former filling a soldier's grave at Huntingdon. One of the daughters is the wife of Joseph Garner, of Henderson township. Another daughter of William Porter became the wife of Samuel Steel, of Huntingdon, and died in 1827. He had two sons. Maj. James Porter, the oldest, was born in Ireland in 1789, and died in Henderson in 1858. He was married to Sarah, daughter of Robert Wray, and reared a family of ten children, viz. : William, Robert W., James D., and John, all living in Warren County, Ill., the latter being a judge there; Joseph, living at Lynchburg, Va.; Thompson, in Missouri; Taylor, in Illinois; and Andrew J., in Nebraska. Of the daughters, Nancy married James Boggs, of Mercer County, Ill., and Martha Mary, John Henry, of the same State. The other son, John Porter, was married to Matilda, daughter of Alexander Steel, of West township, and lived on the homestead in Henderson until his removal to Illinois in 1866, where he died in 1880, about eighty years of age. His children were Alex. S. Porter, who died in Missouri; James M., died about 1859; and William, John, Alice, Martha, Emeline, and Nancy, all of whom became citizens of Illinois. Robert Wray, a Scotch-Irishman, lived about a mile from Porter's, being nearer the river. He died about 1840, having reared several children, viz. : John, who removed to Illinois; Douglass, who died in the same State; William, who became a citizen of Morris township; James, who removed to Iowa; Mary, who became the wife of John A. Campbell, and removed to Illinois; and Sarah, who was the wife of James Porter, and died in Henderson about 1855. John Brown was born in the north of Ireland in 1794. When about twenty-three years of age he emigrated to America, becoming a school-teacher at Lewistown and McVeytown. On the 1st of April, 1824, he married Jane Porter, a daughter of William Porter, of Henderson, and after teaching in Mifflin County until 1835, he also became a citizen of the township, living near the Union school-house. He died from injuries received from falling in his barn in August, 1847, leaving a family of eight children. These were B. F. Brown, of West township; Samuel T., an attorney of note at Huntingdon; William P., an editor, who was killed by a mining accident in California in 1855; Mary Ellen, who married Christopher Capp, and died in 1858; James A., who is a merchant at Huntingdon; John D., who became a Methodist missionary to India, but died at Harrisburg, Pa., in 1878; Robert B., the editor of the Erie Observer; and the youngest daughter, who became the wife of J. Randolph Simpson, of Huntingdon. Mrs. Brown died at the residence of her son, Samuel T., in 1865, aged sixty-seven years. Matthew Hall, a son-in-law of Rev. Samuel Lane, settled in the Unity Church neighborhood, from where, after living a number of years, he removed to Murray's Run, in Oneida, some time about 1840. He was the father of John Hall, and grandfather of James S. Hall, who is one of the foremost farmers in that township. In the Sugar Grove neighborhood James Hemphill was one of the pioneers, removing from there to Illinois. A few of his descendants remain in the county. The general condition of the settlements may be seen in the following list of citizens of Henderson township in 1820, including at that period the borough of Huntingdon, a part of Oneida, and all of the present Brady township. An asterisk denotes the ownership of a town lot with a house thereon. Brown, Daniel (deceased; 200 acres). Coplin, Matthias (distillery; 225 acres). Corbin, William (213 acres; sawmill). Dorland, John, Est. (235 acres). Detweiler, Christian, Sr. (384 acres). Drake, Samuel (ferry; 50 acres). Davis, Rev. James (100 acres). Duncan, James, Jr. (200 acres). *Elliott, Benjamin (saw-mill; 182 acres). Echelberger, Walter (for McMurtrie; 97 acres). Echelberger, Jacob (for landlord; 150 acres). Fee, John (300 acres at Warm Springs Tavern). Hampson, James (250 acres; sawmill). Hight, James (for landlord; 100 acres). Kurtz, Abraham (saw-mill; 220 acres). Kelley, James, Est. (150 acres). Lytle, Robert (for landlord; 40 acres, saw- and grist-mill). Lane, Mary (widow). McGahan, Jacob (48 acres). Metz, John, Dr. (163 acres). *Miller, John, Esq. (205 acres, tannery). McFarland, William (for landlord, 140 acres). Smith, Charles (ground-rents, 100 acres). Starr, James (for landlord, 250 acres). *Smith, Richard (ground-rents, 82 acres). Stover, Christian (for landlord, 400 acres). Starr, Stewart (for landlord, 63 acres). Van Devender, Peter (194 acres). Woolverton, William (grist-mill, saw-mill, distillery, 500 acres). Wilson, Matthew (grist-mill, sawmill, distillery, 128 acres). Armitage, Benjamin (distillery, 170 acres). A number of children of school age were reported as being unable to attend on account of the destitute circumstances of their parents. Civil Government. - The petition of a number of persons, inhabitants of the township of Huntingdon, was presented to the court at its session in April, 1814, setting forth "that they would be much aggrieved by the confirmation of the division of the township, as reported upon by certain viewers and returned to the court, and praying that other viewers might be appointed to divide the said township so as to suit the convenience of the inhabitants thereof. Whereupon it was considered by the court and ordered that Lewis Mytinger, Maxwell Kinkead, and Robert Provinse be appointed to inquire into the necessity or propriety of dividing the said township, and if in their opinion it is necessary to divide the same so as to suit the convenience of the inhabitants thereof and to make a plat or draft of the township proposed to be divided, and the division line proposed to be made thereon, and of the township proposed to be laid off, if the same cannot be sufficiently described by natural boundaries, and make a report of their proceedings thereon to the next court." "The report of Lewis Mytinger, Maxwell Kinkead, and Robert Provinse, who were appointed at the last April court to view and, if they thought it necessary, to divide the township of Huntingdon, which was read at the August sessions, and is now again read and the same ordered to be confirmed as follows, to wit: Agreeably to the annexed order or rule of the court, we, the persons therein named, having all met at Huntingdon on Saturday, the 23d of July, 1814, for the purpose of dividing Huntingdon township, and having examined a draft of said township, and from our own knowledge of the local situation of the said township, are of opinion that the following division line will divide the said township so as to best suit the convenience of the inhabitants of each division, viz. : Beginning at the corner of West township line, on the Frankstown Branch of the Juniata River, near the limekiln, thence down the same to the mouth of Raystown Branch and to the corner of Union township, as may more fully appear by a draft of said township." Gen. Andrew Henderson, in honor of whom the township was named, was prominently identified with the then infant colonies in their struggle against British oppression during the Revolutionary war. He was distinguished for his uprightness of character, and, where best known, most merited the approbation of his fellow-men. One of his descendants, James Pinckney Henderson, was prominent in the affairs of the republic of Texas, and subsequently represented that State in the United States Senate. The western boundary of the township extended northeast from the limekiln on the river to a point beyond the Warm Springs, crossing Standing Stone Creek above that place, where it struck the West township line; thence from that point along that line to Mifflin County; thence to Jack's Mountain, along which to the Juniata at Drake's Ferry. That part of Huntingdon township lying south of the Juniata at the same time received the name of Porter, "in consideration of the distinguished uprightness of the late Gen. Andrew Porter, surveyor-general, as a public officer, and his services during the Revolutionary war." It was bounded on the east by Union township, from which it was separated by Terrace Mountain; on the south was Hopewell township; on the west Woodberry and Morris; and on the north the Little Juniata and the Frankstown Branch of the Juniata. 1789, Andrew Donaldson; 1790, Edward Hunter; 1791, James Dean; 1792, John Ashbaugh; 1793, William McKane; 1794-95, John Ward; 1796, Daniel McMurtrie; 1797, Henry Benner; 1798-99, David Caldwell; 1800, John Dorland; 1801, John Spencer; 1802, David Lloyd; 1803, Henry Canan; 1804, John Eshelman; 1805, John Bare; 1806, Isaac Adams; 1807-8, Nicholas Isenberg; 1809, Thomas McIthon; 1810-11, Henry Lloyd; 1812, John Huyett; 1813, William Kerr; 1814, William Moore and James Hampson; 1815, John Brown; 1816, Robert Wray; 1817, William Woolverton; 1818, Abraham Kurtz; 1819, Abraham Vandevender; 1820, Matthias ,Copeland; 1821, John Fee; 1822, Asahel Brown; 1823, Henry Weaver; 1824, Robert Simpson; 1825, Solomon Sharp; 1826, David Hooley; 1827, David Yoder; 1828, Samuel Goodman; 1829, James Simpson; 1830, James Lane; 1831, John Wolfkill; 1832, John Hight; 1833, John McCartney; 1834, Paul Orlady. 1789, Jacob Laird, Henry Neff; 1790, James Dean, Alexander Dean; 1791, Edward Hunter, Alexander Dean; 1792, John Spencer, George Faulkner; 1793, John Spencer, Henry Miller; 1794, James Dean, William Kerr; 1796, James Nesbit, Alexander Dean; 1796, Peter Swoope, Simon Potter; 1797, David Caldwell, John Fee, Sr.; 1798, Adam Hall, Wm. Moore; 1798, Israel Cryder, Caleb Armitage. 1790, George Reynolds, John Dean; 1791, Peter Graffius, William McCoy; 1792, Andrew Anderson, James Dean; 1793, George Faulkner, Thomas Whittaker; 1795, William McConnell, Joshua Davis. 1789, George Reynolds, Peter Vandevender; 1790, William Kerr, George Faulkner; 1791, Israel Cryder, Jacob Laird; 1792, John Patton, William McCoy; 1793, John Patton, Caleb Armitage; 1794, Thomas Whittaker, Edward Hunter; 1795, Nathaniel Jarrard, David Lloyd; 1796, Charles Green, John Dorland; 1797, John Spencer, Henry Summers; 1798, David Caldwell, Joseph Exeter; 1799, Thomas Johnston, John Wertz; 1800, Charles Kelley, James McGinnis; 1801, Christian Detwiler, Martin Shultz; 1802, William Igo, William Gray; 1803, John Brown, Charles Caldwell; 1804, Henry Lloyd, Isaac Yoder; 1805, Henry Lloyd, John Fee; 1806-7, Henry Lloyd, James Hampson; 1808, Henry Lloyd, Thomas Harrison; 1809, Henry Lloyd, Robert Wray; 1810, Daniel Carpenter, Valentine Heffner; 1811, James Williamson, Valentine Heffner; 1812, James Hampson, Valentine Heffner; 1814, Nicholas Isenberg, James Hampson; 1815, Jonathan Dean, Samuel Renner; 1816, Abraham Kurtz, William Porter; 1817, Joseph Carothers, Henry Souders; 1818, Vincent Robinson, William Henry; 1819, Matthias Copeland, Benjamin Armitage; 1820, John Fee, Peter Case; 1821, James Hight, Abraham Vandevender; 1822, Martin Orlady, John Bailer; 1823, Jacob Detwiler, Robert Simpson; 1824, James Hight, Peter Case; 1825, Robert Wray, Peter Case; 1826, Abraham Kurtz, James Hight; 1827, Christian Miller, John Given; 1828-29, Robert Wray, John Hight; 1830, John Fee, James Hight; 1831, James Porter, Daniel Yoder; 1832, James Hight, William Porter; 1833, James Hight, Daniel Yoder; 1834, James Hight, Jacob Detwiler; 1835, John Decker, Jacob Detwiler; 1836, Andrew Huey, John Fee; 1837, Samuel Hampson, Jacob Dorland; 1838, Samuel Miller, Emanuel Warfleld; 1839, William Barefoot, Jesse Yocum; 1840, Robert Wray, Abraham Shadle; 1841, John A. Campbell, Joseph Roes; 1842, Andrew Allison, Robert Huey; 1843-44, John Wolfkill, Henry Cornpropst; 1845, John Wolfkill, James Hight; 1846, John Wolfkill, Thomas Hamlin; 1847, Andrew Allison, Thomas Hamlin; 1848, Robert Wray, Andrew Decker; 1849, John Porter, Andrew Decker; 1850, David Goodman, John Decker; 1851, James Hight, James Wilson; 1852, James Hight, James Porter; 1853, James Hight, Henry Hutchinson; 1854, James Hight, Hiram Grady; 1865, Jacob Miller, George Numer; 1856, James Hutchinson, John Drennen; 1857, Jacob Hetrick, John Decker; 1858, Abel Corbin, Hiram Grady; 1859, John Numer, Daniel Kyper; 1860, Jacob Hetrick, John Numer; 1861, Jacob Hutchinson, George Miller; 1862, Henry Steel, George Miller; 1863, George Miller, Samuel Hetrick; 1864, A. Allison, J. Numer; 1865, Jacob Hetrick, John Flenner; 1866, Jacob Hetrick, James Sloan; 1867, Laben Hall, John Warfel; 1868, Jacob Hetrick, David Rupert; 1869, Jesse Henry, James Wilson; 1870-71, Samuel Eby, J. S. Warfel; 1872, Samuel Eby, John R. McCartney; 1873, R. M. McCartney, H. P. Decker; 1874, no report; 1875, Henry Steel, Andrew Decker; 1876, William Mundorf, H. P. Decker; 1877, J. K. Hetrick, William Mundorf; 1878, J. K. Hetrick, Michael Enders; 1879, Lewis Bergantz, Joseph Rupert; 1880, Joseph Enders, George Black; 1881, Andrew Decker, C. C. Evans. General Industries. - The chief employment of the people of Henderson is the tillage of the soil in the ordinary farm operations and fruit-culture, but formerly the lumber interests gave occupation to a large number of men, nearly all the small streams being made to operate mills of limited capacity. A number of these are noted in the several property lists of this book, and others are here briefly mentioned. On Brown's Run, in the northwestern part of the township, John Colestock built a saw-mill many years ago, which is now operated by J. S. Warfel. On Sugar Grove Run James Simpson built a mill, which became the property of Samuel Goodman, and later of John Rupert, who yet owns and operates it. Near Mill Creek, on the canal and operated by the waters thereof, Samuel Simpson had a lumber-mill for many years, which was built about 1847 by William Buchanan. At the same place was formerly operated machinery for grinding fire-clay, which has been removed and is now in use in Brady for preparing fire-clay for the markets. Midway between Mill Creek and Huntingdon is an extensive and fully-equipped lumber manufacturing establishment belonging to Isaac Deihl & Co., and operated the past few years. The logs are supplied chiefly by the Raystown Branch, and are gathered into a boom near the mill. Steam is the motive-power, and the machinery consists of circular saws, edgers, lath saws, and other apparatus used in first-class mills. The capacity is about twenty thousand feet per day, and when fully in operation the mills give employment to a considerable number of men. Above that point, on the Pennsylvania Railroad, are the Ardenheim Pipe Works. These were established in 1878 by C. H. Anderson for the manufacture of pipe and stoneware from the clay deposits in that locality. The vein is seven feet in thickness, and appears about five feet below the surface. It consists of three distinct clays, of whitish, bluish, and yellowish colors. When properly manipulated it produces superior vitrified ware, being surpassed for these purposes by no other native clays. Mr. Anderson employed hand-machines in his works, lack of capital preventing the employment of steam-power. The capacity consequently was limited, and after a year's operation the works were discontinued. A small pottery, formerly carried on by P. Snyder at Ardenheim, has also been discontinued. Ardenheim Station received its name at the suggestion of one of the officials of the railway company, who wished in this way to perpetuate the memory of a German recluse by that name who lived near Philadelphia. Its nearness to Huntingdon (being only a mile and a half below the borough) has prevented it from becoming a business point. It is a flag-station, and contains half a dozen houses. At this and at other points on the old turnpike, when that thoroughfare was one of the great highways, inns were kept for the entertainment of the traveling public, one of the most noteworthy being known as the "Red House," which was a short distance above Mill Creek. It had a number of keepers, Gershom Lambert being among the number. He removed to the West, where his son Daniel became a very wealthy man. Alexander Carmon was also one of the landlords at this house, removing thence to Huntingdon. The proximity to that borough has prevented the citizens of Henderson from engaging in mercantile pursuits, only one small store being kept in the township. In 1871, Jacob Hetrick began selling a few goods at Union Church, and still carries on a limited trade. He is the deputy of the only post-office in the township, Joseph L. Bergantz being the postmaster. Union Church post-office was established in the summer of 1876, with George F. Hetrick as postmaster, Mr. Bergantz being his successor. Mails are supplied on Wednesday and Saturday of each week, the service being from Huntingdon by way of Cornpropst's mills. In that locality mechanic shops have been maintained many years. On a tract of land which had been improved by the Rev. Jesse Ash, for some years the pastor of the Baptist Church at Mill Creek, Adam Warfel lived and carried on a blacksmith-shop. Subsequently Samuel Tyhurst, the father of the late Al. Tyhurst, was the owner of the shop. While returning to his home here from Newark, Ohio, Samuel Tyhurst sickened and died at the residence of his brother at Neff's Mills. The family soon after removed to Alexandria. The next smith was Jacob Hetrick, who came to the neighborhood in 1855, and for ten years followed that trade on the old Thomas Gorsuch place. For a short time Samuel Hetrick carried on a shop near Union school-house, selling out to James Barris, a carpenter. In the vicinity of the church, David Thompson was for a long term of years a blacksmith, and in the northern part of the township Lewis Bergantz has a smithy for the accommodation of the people of that section. At Union Church is a hall in which assemble statedly a grange of Patrons of Husbandry, of which Joseph Bergantz is the secretary. Among the enterprising men of the present day in Henderson may be mentioned Mr. Samuel Eby, of whom the following is a brief sketch. The Ebys of Lancaster County, Pa., figured among the early settlers in the Keystone State, and in old Lancaster developed into a large connection. Benjamin Eby, a native of Lancaster County, moved to Franklin County early in life, and followed an active career as blacksmith and farmer. He had six sons, of whom Joel, Jacob, Benjamin, and Henry went to the West, John died in Perry County, and George (born in Lancaster County, April 2, 1795) settled in Franklin County, Pa. The last named married Susanna, daughter of Jacob Lutz, of Huntingdon County. In 1828, George Eby moved from Franklin County to Shirley township, Huntingdon Co., where he died Jan. 16, 1882, aged eighty-seven. Although blind for some years previous to his death, he was fairly active and hearty to the last. His widow died in August, 1882, aged also eighty-seven. They were married in 1819, and accordingly enjoyed a union of sixty-three years. They had seven children, - Jacob, Nancy, Samuel, George, Catherine, John, and Sarah. Samuel, the third child, was born in Franklin County, March 3, 1824, and remained at home until his twenty-sixth year, assisting his father in farming. April 1, 1851, he married Catherine E., daughter of John Morrison, of Shirley township, Huntingdon Co., and soon thereafter embarked in business as store-keeper at Mount Union, in partnership with his brother George. At the end of two years Samuel purchased his brother's interest, and conducted the store alone for the next three years. He then retired from mercantile life, and forming a partnership with Mr. Wise for that purpose, took a contract for building a bridge in Juniata County, having already had experience in that direction in the erection of a bridge at Huntingdon. In March, 1859, he bought a fine river farm of upwards of three hundred acres, lying in Henderson township, Huntingdon Co., and removing thereto at once, has resided upon it ever since. He has handsomely improved the place, and in 1876 erected upon it what is by far the best residence in the township. Mr. Eby has been a township school director pretty much all the time he has lived in Henderson, and in minor local offices has always borne his share of duty. He is a lifelong Democrat, as was his father before him. He is the friend of progressive ideas, a stanch supporter and promoter of the cause of public education, and fully alive to the belief that every man, whatever his condition, owes it to himself to keep step with the advancement of the age. Mr. and Mrs. Eby have had nine children. The living are Hannah M., Alice S., Wilbert E., Juniata, and Samuel P.
"Previous to the erection of the house the school had been held in the upper story of a dwelling-house near by, the teacher with his family occupying the lower story. The speaker well remembered his first visit to the school-house as a pupil on a frosty autumn morning, in his bare feet, and being early and finding the door locked, and being compelled to warm his feet in the sunlight on a pile of chips till the arrival of the teacher. The furniture of that school-room consisted principally of a dozen or so of benches made of yellow-pine slabs, hauled from the saw-mill at Huntingdon, with legs so long that the smallest boy could, when seated, just reach the floor with his toes. Some of the boys in this crowd were there during that winter. The teachers he could not attempt to describe. His impression then was that they were rather severe, and disposed to keep the boys a little too close to work, but he was now inclined to think that they were but doing their duty with the rough material and appliances at hand. The object was to instill into the youthful mind the Shorter Catechism and the rules of arithmetic, with an occasional effort to force upon us a few of the rules of grammar, in which they did not succeed, as the audience would observe before the speaker concluded his remarks. "The house was erected in 1831, and he could not tell how much time he had spent there. It seemed to him a long time, but he remembered of being kept at home one or two winters, in order to keep him even with the rest, his father being very democratic in his ideas, and not wishing any of his sons to get too far ahead. The surroundings have all changed. It does not look like it did then. He remembered the long weary hours he had spent there during a session in summer, and could imagine nothing short of an ague chill that could make time last so long. He used to sit on one of the high benches all forenoon and wish it was noon, and for four long hours during the afternoon wishing it was night; when he wanted out so badly that he built castles in the air, and imagined a causeway built from the farther window, extending around the grove and back to the other window, and spent hours traveling in that circle, and having a good time, until awakened to a sense of duty by the teacher's rod. School-houses have improved since then. One word in regard to the old worthies that built this house fifty years ago. They were then in the prime of life, and were performing a duty to their children to the beet of their ability. They built this house and planned it, and there is scarcely one of them left. Nearly all have laid down the burden of life and gone to the better land, but the fruits of their labor no mortal will ever know. It was built for a school-house, but they built and planned it also for a house of worship. Thank God, they were catholic enough to build a house where all men could meet and worship according to the dictates of their own conscience, where Presbyterians, Baptists, and Methodists might mingle in the common worship of a common Father. Like the Puritan fathers they came here to worship, and unlike them they permitted others to do the same. They were free from the fell spirit of persecution which the Puritan fathers brought with them, and were so much farther advanced in Christianity and religious toleration that they agreed that all might worship here. Many of us have attended the indiscriminate ministry of all denominations and received good lessons from all. They were God-fearing men, and built their ideas of religion and secular education on the Bible and its teachings, and they built wisely and well. They were all farmers, and not one of them had ever seen a rubber applied to a wagon. Not one had ever seen a railroad train, and not one had ever seen a threshing-machine, except the old-fashioned flail. Times are changing, and we are changing with them, but this old Bible upon which they builded, and the doctrines upon which it is based, are immutable and will stand forever. Those hills in which I could once see no beauty in looking over them, after an absence of thirty years look beautiful now. Fruitful fields and smiling farms are now to be seen where then there was nothing but woods." "What of the founders and early scholars of this institution? I would like to speak of them as individuals, but would I stop? Had they any distinguishing traits as a class or community? They were not wealthy, powerful, or learned. They had to contend from the start with a rugged forest, a sterile soil, and steep hillsides. Not a rich man among us all to give us influence or power. Our common school system was not then in existence. Education could only be obtained by the determined perseverance of our parents and ourselves. Every family must devote the long months of summer and fall to labor in order that the children might have a few months of schooling in the winter, and yet it would be hard to find a neighborhood in which so few could be found without a fair common education. As a general rule, we could read, and did read all the books we could buy or borrow. Although the conditions of life were somewhat bard, we were not at all intimidated or cast down. Perhaps we enjoyed life as well, after all, as many communities more highly favored. Every man, woman, and child was ready to help a neighbor in a pinch. Even the labors of the farm and household were made the occasion of many a social gathering, and I venture to say that very many of us look back to apple-cuttings, the choppings and log-rolling, the stone-haulings and corn-huskings as among the happiest days of our lives. We did not see or handle much money, but we learned how to do all sorts of useful work while yet very young. Training of this kind made us healthful, vigorous, and self-reliant. Many of us, I know, came to the conclusion early that the boy or man who could make a living here could make a living anywhere, and might make a better one some other place. So we scattered and separated until to day the homes and the graves of that sturdy band are found in every State stretching westward from these slopes of the Alleghenies to the far-off Nevadas on the Pacific coast. As a general rule, they have held their own wherever they went in the battle of life. They have not been office-seekers or office-holders to any extent, and this, I hold, is to their credit. All they asked was a fair field and no gouging. They were willing to give the odds of wealth and start where others had it, and often managed to come out even at the end of the race. "That the graduates of this log college succeeded in life was owing as much to the store of health here laid in as to any mental training. Clearing and tilling these rugged hills was hard work, but the air was fresh and invigorating. We had no college campus or gymnasium for our youthful sports when at school, but the open woods all about the building gave ample space for prisoner's base, corner-cat, and town-ball. Here I must say no amount of learning will produce its best results unless accompanied with vigorous health. The practice of imposing on children and youth a long course of school and college training, at the expense of physical development, is like crowding a cargo of rich merchandise into a frail and feeble vessel and sending it forth to meet the storms and tempests of the ocean. If the early settlers here had any distinguishing trait of character it was, in my judgment, a sturdy, honest self-respect. Every man had his own opinion, and stood ready to maintain it. This, as a general rule, applies to the generation of my own age as well as that preceding it. I can say for myself that though I have been as poor and obscure as I well could be, I never saw the day when I did not consider myself the equal of the best boy or man I ever knew or heard of, and just as good as I am to-day. I believe that was a prevailing trait of character among my kindred and friends here, and if any of them differed from that standard they fell just so far below the general average in all that made this community respectable and respected. "In looking back over the roll of scholars of thirty or forty years ago, I find that a very large proportion of them became teachers, for longer or shorter periods. I think more than one-half of them taught school more or less; not as a permanent business, but doing it well for the time being, and making it a stepping-atone to something more lucrative. In the family of my uncle, James Porter, there were eight sons, and seven of them taught school. In our family there were eight children, and seven of them were teachers for a time. It has been said that the boys of New England are born with spelling-books in their mouths, but I doubt whether you could find many school districts in New England that would 'spell down' the old 'Union' in its palmiest days. We prided ourselves in the art and mystery of spelling, and our spelling-schools ranked well up with our singing-schools. These institutions gave us a great deal of fun and solid enjoyment. I think there has never been anything invented quite equal to a country singing-school as conducted here. "During my early life this was not only a school-house, but it was our church, our lyceum, and our academy of music and public hall as well. "This was always a religious community, and though in my day here the majority of the people were Presbyterians, they always turned out to hear any preacher who came along, and filled the old house from door to platform. Mr. Peebles gave us the gospel according to Presbyterian forms, and Jesse Ash and old Father Thomas gave us the Baptist doctrine. Afterwards William Jones came here as a young Baptist minister. He was somewhat sensational, and stirred up a little breeze among our conservative old church-goers. Theology, immersion, and sprinkling were the leading topics of discussion among us for a time. I remember my mother told Rev. Jones to his face that the Baptists were sound Calvinists just as the Presbyterians were, but he was not preaching the doctrine of his own church, but preaching Arminianism, and she would hear no more of it. My mother knew all about the Catechism and the Confession of Faith, and she read the Bible and Buck's Theological Dictionary with close attention. Mr. Jones was never converted to Presbyterianism, however, but he afterwards married a daughter of Mr. John Postlethwaite, a Presbyterian elder, then became a Seventh-Day Baptist, went to India as missionary, returned to England, and is now preaching to a congregation in London. I believe the Methodists never had any regular preaching here, at least in my day. The Lutheran Church has now become the leading denomination, and I am glad to know they maintain the reputation of the old neighborhood for religion and good morals." "I think I can safely say that one of the earliest scholars in that log or block-house was Elizabeth Postlethwaite, afterwards my dear companion for nearly a score of years, and who became accustomed to the French language in the West Indies, Hayti; afterwards a teacher in Shelah Academy, New Jersey, and after that a student in Arabic and Hebrew in Palestine. In all three languages she was quite proficient. Though never pretending to brilliancy, she was, nevertheless, solid and real in all that she did, and her linguistic attainments were perfect as far as they went. There was no show in her attempts to speak either French or Arabic, and her Hebrew was good enough for a theological graduate and some to spare. Her mortal remains, and those of her youngest child, lie buried in the American cemetery on Mount Zion, just without the walls of Jerusalem." Among other teachers at the Union school-house were John Brown and his wife, Jennie Porter. Mr. Brown was a thorough teacher and a rigid disciplinarian. He was endowed with quick perceptions and a wonderfully retentive memory, which enabled him to repeat page after page of Burns, and to retain the facts of history fully in mind. On the return of each Sabbath-day he apportioned to every member a certain amount of Scriptures or catechism, which had to be learned during the week, under penalty of severe punishment. Contrary to general custom, he used neither liquor nor tobacco, and abhorred the forms of profanity so prevalent in many localities. As illustrating this trait of his character, it is related that on one occasion, while his pupils were at play, a young man passing along the road used profane language in conversation with the children. This being reported to the teacher, he was greatly incensed, and he determined to punish the young man on his return home. When he saw him approach the house he tapped on the window to attract his attention, and called him in. After ascertaining the truth of the report from the young man himself, he took down the ever-ready birch and gave the astonished fellow a sound thrashing, and after admonishing him not to repeat his offense, told him to proceed on his way. Although this was rather an arbitrary use of power, it gives us a glimpse of the stern qualities of the teachers of that period when they were actuated by moral principles. The excessive immigration from Henderson had a depressing effect upon the schools and churches of the township, so that these interests have latterly not been conspicuously noteworthy. The future of schools, however, promises to be more auspicious, and even now Henderson has a not unfavorable exhibit in educational matters. In 1880 seven schools were maintained, each five months, at a cost of nearly one thousand dollars. The average number attending was one hundred and forty-one. Decker, Stephen Gorsuch; 1853, James Goodman, John Flenner; 1854, Jacob Miller, John Warfel, James Wilson; 1855, Elisha Shoemaker, George Hamer; 1856, John Rhodes, John Flenner; 1857, John Goodman, John Porter; 1868, James D. Hight, John Warfel; 1859, John Numer, Adam Rupert; 1860, David Hare, Jacob Hess, George Miller; 1861, Samuel Eby, John Warfel, Henry S. Miller; 1862, Thomas Dorland, Daniel Rupert; 1863, William Mundorf, Lewis Bergantz, John Warfel; 1864, Samuel Eby; 1866, James Barras, Simon Bayles; 1866, James Wilson, John Rhodes; 1867, Daniel Rhodes, Simon White; 1868, John Numer, Lewis Bergantz; 1869, William Mundorf, Samuel Eby; 1870-71, A. Decker, J. A. Shultz; 1872, George Miller; 1873, Samuel Steel, Joseph Enders; 1874, D. Rhodes, L. Bergantz; 1875, Samuel Eby, Charles Estes; 1876, Laben Hall, G. F. Hetrick; 1877, Samuel Eby, David Peightal, Samuel Steel; 1878, Laben Hall, George W. Bergantz; 1879, Daniel Rowland, Samuel Eby; 1880, Henry Steel, Andrew Decker; 1881, Henry Lamp, William Hern. The Mount Zion Evangelical Lutheran Congregation, and has since served as a place of worship for that church. The congregation was formed about 1858 of a number of persons, among whom were Joseph Camp and wife, Jacob Hetrick and wife, John and Rosina Rhodes, Samuel Hetrick and wife, Rachel, Catherine, and. Elizabeth Hess. The church had the same pastors as Huntingdon until 1874, when, in connection with Mill Creek and McAlevy's Fort, a new charge was constituted, with the Rev. A. A. Kerlin as pastor. His pastorate was terminated May 1,1881, and in July following the Rev. S. Croft took charge of these churches. Mount Zion has ninety communicants, and a church council composed of William Mundorf, John Hall, Henry Steel, and Joseph Bergantz. In the first council were Robert Sherlon, elder, and Jacob Hetrick, deacon. Among the elders have been George Hetrick, James Hall, Daniel Rowland, Joseph Garner, and others. Unity meeting-house has been repaired, and now presents a fair appearance. In this house a Sunday-school has been maintained, first by the Presbyterians and since by the Lutherans, which has been attended by the people of the central part of the township in general. In the summer of 1881 the enrollment was one hundred members, and William Mundorf and William Hern were the superintendents. Although other denominations have a following in the township, their main organization is outside the limits of Henderson.